Action from the Division Two play-off final between Tydd St Mary (red) and Langtoft United Reserves. Photo: David Lowndes. A deadly three-goal burst in eight first-half minutes paved the way for Tydd St Mary to win promotion from Peterborough Division Two yesterday (May 20). Tydd St Mary went on to win their play-off final 4-1 against Langtoft United Reserves at Yaxley FC’s In2itive Park. They join champions Ramsey and automatically-promoted AFC Stanground Sports Reserves in Division One next season. A strong challenge from a Tydd St Mary player (red) during a 4-1 Peterborough League Division Two play-off final win over Langtoft United Reserves. Photo: David Lowndes. Tydd led 4-0 at half-time before a Langoft team who had played competitively just once since April 1 pulled a goal back early in the second half. 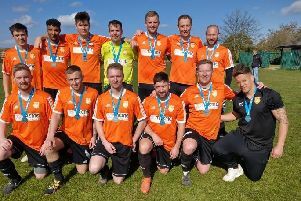 Eye United were gifted the final promotion place from Division Three when scheduled play-off final opponents Sawtry Reserves cried off after failing to raise a side! Stanground Sports Reserves lost their second final of the season when throwing away a two-goal lead in the PFA Challenge Cup Final at In2itive Park on Friday (May 19). Aaron Dunmore and Thomas Osborne scored the early goals for the city side, but Division One champions Harrox crucially pulled a goal back on the stroke of half-time through Andrew Williams. Action from the Peterborough League Division Two play-off final between Tydd St Mary and Langtoft United Reserves (black). Photo: David Lowndes. A goalkeeping error from Ryan Venters presented Daniel Lambe-Hyner the equaliser on a plate and a foul by Venters 10 minutes from time enabled skipper John Ball to score the winner from the penalty sport 10 minutes from time. Stanground Sports were also beaten in the final of the Peterborough League’s Intermediate Shield by Farcet. Moulton Harrox Reserves 3, (Ball, Lambe-Hyner, Williams), AFC Stanground Sports Res 2 (Dunmore, Osborne). Langtoft United Reserves 1, Tydd St Mary 4.